Manchester United have been in the news for the past few weeks as the transfer of Alexis Sanchez has generated furore. The 29-year-old has finally joined the Red Devils on a stunning four-and-a-half year deal on a staggering £450k wage package. United manager, Jose Mourinho is slowly starting to build a very formidable team capable of challenging for the major titles available. While the signing of Sanchez has been lauded, Jose Mourinho is still looking for reinforcements to bolster his ranks. We take a look at two players that can strengthen the United team sufficiently. The 30-year-old Chilean international is expected to leave Bayern Munich this summer after the signing of 22-year-old Leon Goretzka. 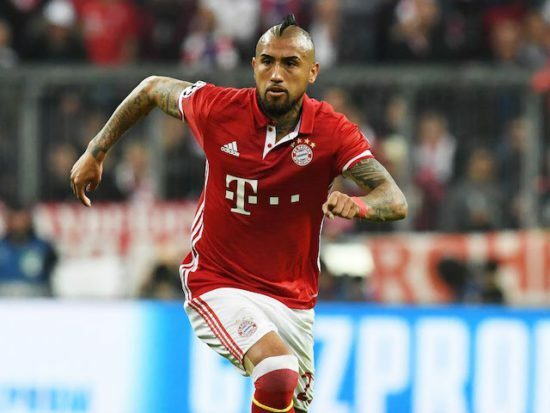 Vidal has not maintained a regular place in the thoughts of Jupp Heynckes, who has rotated his midfielders in a bid to keep them fresh for the business end of the season, but for a player who has played all his life, it is a new situation for the former Juventus enforcer. He has been linked to Chelsea, as Blues manager, Antonio Conte seeks to reunite with his former player at Juventus though United boss, Jose Mourinho is a big fan of the player and may try to sign him ahead of the Chelsea handler. Former PFA Player of the Year is back to his brilliant best of two seasons ago as he has found his form under Claude Puel. Despite his obvious talent, he has not been the subject of interest from any top six side, and he would offer another kind of threat for us going forward should we sign him. Manager, Mourinho had been desperate for a left footed forward in the summer with his failed pursuit of Ivan Perisic but in Mahrez, we could have a player already suited to the Premier League and capable of adding attacking threat to our already brilliant team. United are on a quest to win all trophies on offer, and with these two players, the title seems just like a grasp away.